To the right of the porch 1st and 2nd floors. Entrance from rear patio through porch to beamed dining kitchen. Level access to bathroom with shower.1 step up to cosy sitting room with radiant fire and slate fireplace. Also on this floor, two steps down from the hallway is an optional additional twin bedroom. This is particularly suitable for guests who prefer not to use the stairs. Stairs up to first floor leading to master bedroom with king-sized bed and en-suite bathroom with power shower. Twin-bedded room. Night storage heaters and panel heaters. Poachers Pocket is a spacious yet cosy self-contained luxury apartment formed from the middle and upper floors of the north wing of Cyffdy House and is dated at 1888. It was formerly the servants’ quarters and grain store and has its own private rear access – although on the middle floor of the house, curiously still at ground level and easily accessible to guests with limited mobility. Electric heating throughout. Fuel included. No smoking in the cottage please. 1 small dog welcome – special rules apply. Please note that Poachers Pocket is offered at 2 price bands, for 4 or 6 guests, depending upon whether the additional optional bedroom is booked. The additional bedroom is on the lower floor and is not suitable for young children. Minimum stay 2 nights, terms apply. The property features central heating, a microwave, a fridge/freezer, a washing machine,a dishwasher, 2 TV’s, a DVD player and a radio/cassette/CD player. Cottage rental is inclusive of bed linen, bath mats, tea towels, towels and fuel. A travel cot, high chair socket covers and safety gate are available, please note that baby cot linen is not provided. Steam iron and ironing board. There is a bath, hand basin, WC and a shaver point in the main bathroom and the ensuite bathroom consists of tiled step in power shower, wc and hand basin. For your convenience, drying facilities and boat storage, a power-washer and storage for cycles are available in the barn. The cottage does not have a tumble dryer, but we do offer a complimemtary clothes drying service. Cycle hire is available in Bala. A barbecue and garden furniture are provided and there is very basic arn for barbecues if the weather is not co-operative. 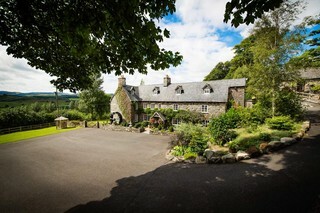 An elegant function room - The Retreat - is available for hire for group usage by prior booking.